When Evelyn Tremble is admitted to Vesper Lynd's apartment, she uses a fancy fandangled video door entry system. After dressing up in a variety of costumes for her entertainment, including Hitler and Napoleon, he leaves for the “James Bond 007 Training School”. As he enters he has his photo taken with a tiny Minox camera, for security purposes. We then move on to a malfunctioning bowler hat with a gun or shooting system thing inside. 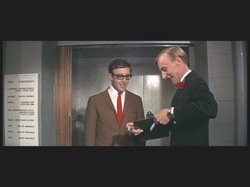 On Q’s instruction, Fordyce provides Tremble/Bond, “I shouldn’t use that pen, sir. The moment the nib touches the paper it releases a stream of poisonous gas into the writer’s eye”. The wristwatch is suitably fancy – A Two Way Television Radio Watch, no less. “It’s an American idea, they got it from one of their comic strips”, says Q. If that wasn’t all enough, James gets a protective body warmer, come bullet proof vest, come gadget store. And we have... A poison capsule compartment, Switchblade and combined Geiger Counter, Intercom with midget transmitter suitable for short wave contact, Infrared Camera, Tape Recorder, Button Hole Beretta, and a, “Cute little mini gun in the gusset”. I think this is what is described as making fun of a subject matter. 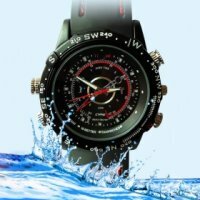 If you're looking for multi-tasking spy gadgets you can't get much better than this waterproof spy watch camera. It videos in HD quality and has 4GB of internal memory providing plenty of space to store hours of videos. It comes with a built-in microphone which allows you to record video with sound. It also comes with a USB port for easy uploading of your videos to a PC or laptop.